As an Exchange administrator, you may occasionally come across a situation where in a particular mail account on your Exchange server is unable to send mails to a specific domain. The Exchange user receives a Server error: '550 5.7.1 Unable to relay'. This generally happens when you try to send mails to addresses that are outside the domain of your company or organization. Mail Relay generally happens when you connect to a mail server on one domain and try to send mails using another server on an external domain. This error signals that the outgoing mail server is unable to recognize you and hence, won't allow you to send mails. Another possible reason may be that there is no recipient policy for the expected domain in your organization. Start Exchange System Manager (ESM) and go to the SMTP virtual server that you are currently using for sending mails. Select 'Properties'-> 'Access'-> 'Relay'. Now, check if the "Allow computers which successfully authenticate to relay" option is enabled. You may try setting maximum diagnostics logging on MSExchangeTransport, the Queuing Engine, and the Connection Manager for the server associated with the problematic user. Check out the application event log for Exchange server errors and then try to resolve them by reading various articles online. 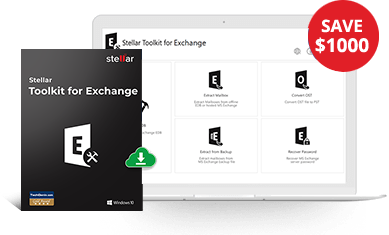 Select – Run Stellar Repair for Exchange and select the Exchange database (or EDB file) to repair. You are also required to specify the version of Exchange server currently being used. Click 'Start'. Scan – You have an option to perform either 'Quick Scan' or 'Extensive Scan'. Choose the desired scan algorithm and click 'OK' to start scanning the selected file. Save – Select any mail item to see its preview in the right pane. Click 'Save Mailboxes' icon on the tool bar and specify a destination path. The software will save all recovered mailboxes at your specified location in the system. Our Exchange Recovery software supports recovery of databases created in MS Exchange 2019, 2016, 2013, 2010, 2007, 2003, 2000, and 5.5. Moreover, it is compatible with Windows 10, 8, Windows 7, Vista, XP, and Windows Server 2012 and 2008.